Right out of the box, the Seydel Saxony Orchestra tuned 12 hole chromatic harmonica is a very fine instrument. However, it can be made into a world class performance instrument with minor customizations which address its few weak points. Let’s begin with what’s right with the Seydel Saxony. First, the actual precision construction is superb…parts fit with a precision unequaled in other medium priced chromatic harmonicas. You’ll find superb fit of all the mouthpiece parts: the H bar, Slide, Blank, and Mouthpiece itself. Quality construction materials are also in evidence throughout. The big design wins on the stock instrument are the almost indestructible stainless steel reeds…they are very hard indeed, best breath savers (dimpled) on the market, and finely shaped aluminum alloy comb which is coated to eliminate any corrosion. It’s a bullet proof instrument which is an ideal platform for customization to take it to a world class instrument level. First, the angles between the top face of the mouthpiece and sides of the mouthpiece are a bit too sharp…they will create minor discomfort when playing octaves as the mouthpiece presses against the sides of your mouth, and perhaps even when playing at other times. The button is a poor design…way too small and with a concave lip which bites the hand when activating the slide. The very small profile of the button on the slide means that your hand touches the right side of your face lightly when the slide is activated. The volume from the stainless steel reeds is a bit quieter, and the use of rubber washers on the cover stanchions (the little pegs inserted in the comb to keep the covers the correct distance/ in the Saxony’s case these are screws with a rubber washer) tend to deaden the resonance of the instrument a bit as they deaden the covers’ vibrations. The orchestra tuned instrument is an excellent choice, as you get the “sweet spot” of from G3 to F#6, but note that the standard tuning on the final E hole give you E/F/F/F#, leaving you one note short of a full 3 octave spread. The correct solution to the too-small button issue is to design a button which is ergonomic to the hand and which extends out ½ inch further. To accomplish this, Mr. Kettlewell approached a metal fabricator/instrument repair professional, Sid Marlin in Ohio, USA, and the two worked with a metal lathe and aluminum stock to shape a new ergonomic button. As there are many angles one touches the button on, the button shape is bulbous at end…from any direction of the touch, the button is comfortable to the hand. Being ½ inch longer than stock, the slide becomes much easier to activate, which greatly improves the playability and comfort of the instrument. 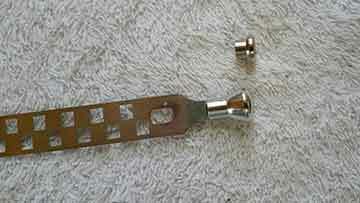 Removal of the stock button was simple: the slide was removed from the instrument and covered on both sides with thin piece of wood and all taped shut, this was then held by the author…button down…while Sid Marlin used rolled tong pliers, placing them on the bottom edge of the existing button and whacking it with a small hammer. The button came off easily. The new button was shaped on a metal lathe from aluminum stock. Aluminum was used as the new button is 5x larger than the stock one, and is sprung or moving weight…by that, we mean that the button moves in and out rapidly, so the weight is best kept minimal. Care was taken to create a button shape ideal to fit in the hand…no edges of any kind to bite the hand, and large enough diameter at the outside portion to nicely spread any pressure placed on the hand when the slide is activated. Of course a new pocket was drilled in the back of the new button for the end of the slide to stick into, and the slide was then epoxied to the button. This customization addressed the biggest problem of the Seydel Saxony from factory…the button shape and size. This customization had several elements, and departure from typical mouthpiece design to accomplish unusual goals. First, the two upper edges of the mouthpiece were filed down by Mr. Kettlewell in his workshop with a metal file and sanded smooth with stones, then polished with oil and 500 grit sandpaper, then polished by hand with fine compounds. It happens that even world class chromatic harmonica players will start a piece on the wrong note, (the harmonica provides very little visual reference for exact note position while playing) and Mr. Kettlewell decided it would be an easy matter to simply put very small INDENTS in the lower portion of the mouthpiece which could be felt by the tongue to provide positive identification of note position. Of course it is understood that the indents are of use only at the start of a piece, or at a lull, and provide no help on note identification when moving at speed over the mouthpiece. The indents had to be noticeable enough to be picked up by the tongue, but not impair movement of the lips or tongue on the mouthpiece when playing. Hole positions were first marked with a permanent marker, the bottom of the mouthpiece covered with electrical tape to protect the mating surface, and the INDEX mark cut into the metal with a file edge. Then a dremmel tool with small circular sanding disc was used to cut the INDEX marks and shape them into small V shapes, taking care to ensure that the INDEX marks were cut in the correct placement. The essential V shape of the index marks was then polished out with a dremmel rotary tool with polishing nub at high speed with fine compound…creating a shape which was quite smooth to the mouth but which did provide positive note identification. (Brendan Power INDEXES his mouthpieces using another method…a small hole indent is drilled in the covers, done because he plays with so many different tunings, and this provides him reference.) Of course, it would also be possible to index a mouthpiece by creating dots which raise up, but this is best done when casting the metal, and was not considered the best solution. This unusual design provides more comfort to the mouth, and INDEXING, which may or may not be useful to the player, as the player may perceive things. To improve projection of what is a somewhat quieter stainless steel reed instrument, the stanchions were removed, and the covers reshaped at the back by pulling them open…with the covers on the instrument. Any reshaping done to covers off the instrument will typically affect their fit at the front by the mouthpiece…so all shaping was done with the covers attached. As the hands touch the instrument constantly when playing, smoothing the edge of the reed plates and the corners of the comb is in order. A small fine sanding stone was used for this, taking care that nothing entered the harmonica which might affect the reeds or breath savers. Light touch up of the dark grey comb was done where the edge was smoothed. 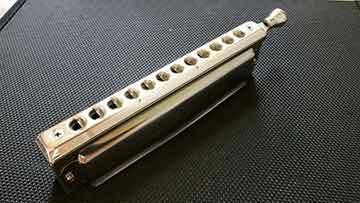 Very minor smoothing of the back edge of the harmonica covers themselves was done. These changes make the instrument more comfortable to the hand, and eliminate any biting. It seemed far preferable to have the four notes of E F F# and G on the final hole, as this provides a full 3 octaves on the Seydel Saxony orchestra tuned instrument. To accomplish this, the reeds were returned by Mr. Kettlewell using a dremmel tool with sanding stone and an electronic tuner to test pitch. Retuning stainless steel reeds is a challenge…they are quite hard. The reeds in the last hole were altered from the stock E/F/F/F# to E/F/F#/G. When one needs that G, either one has it or does not. Right out of the box, the Seydel Saxony Orchestra tuned 12 hole chromatic harmonica is a very fine instrument. While the slide is quite smooth from factory, light polishing with swirl compound can make it run more easily, polishing only done on the flat sides, not the thin edges. Also, by smoothing the edges of the oval holes for the mouthpiece screws in the slide, top and bottom, damage to bumpers over time as the slide hits the bumpers can be minimized to the point where bumper wear is essentially eliminated. This was done with the dremmel with nub and fine compound. The completed instrument is extremely ergonomic to play, comfortable to the hand, has the G6, and possesses increased projection and harmonic resonance. As such it is a worthy competitor to instruments including the Polle Concerto and NC 64, which are phenomenal instruments, but sport a cost of from $7,500 to $12,000. I will mention that the Polle Concerto and the NC 64 do things the Seydel does not, but the Seydel can at least be in the running with customizations. If you would like to discuss customization of your Seydel Saxony, or are interested in this instrument, contact Mr. Kettlewell at d.kettlewell@live.com, and please put the words Seydel Saxony Customization in the title of your email. Out of the box, the Seydel Saxony orchestra tuned 12 chromatic harmonic is one of the finest instruments made. With customizations, it is a world class professional performance instrument.